If you want a kitchen which perfectly marries classic and contemporary, then the Broadoak Natural will be the answer to all of your prayers. The stunning oak finish creates beautiful neutral colour palette to begin your kitchen design with, allowing you to perfectly accessorise in both lighter and darker shades. 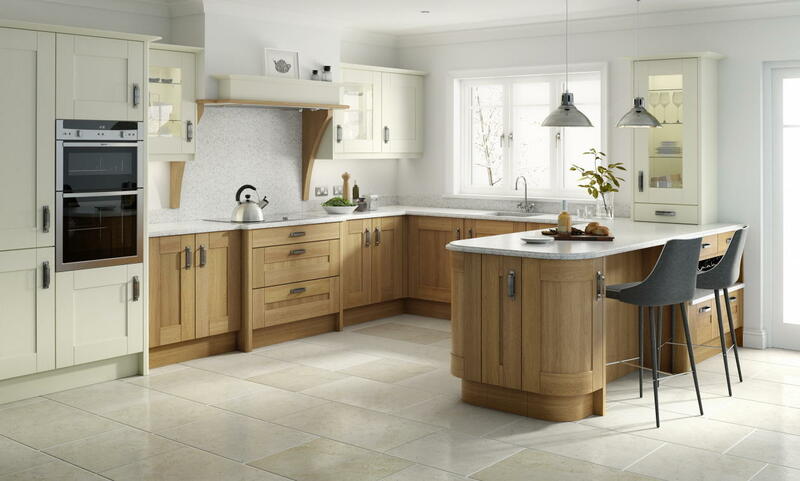 The Broadoak natural contemporary oak wood kitchen is a stunning addition to any home. With stunning fitted cabinets along the wall, the Broadoak Natural branches out to a feature peninsula section at the end, offering an endless host of surface space for food preparation and entertaining. Finished with a stunning glossy work surface, you can choose the material of colour finish for your worktops, allowing you to choose your perfect colour palette for the head of your home. Broadoak Natural features internal curved cabinetry which not only embodies the true shaker-style kitchen, maximising your storage opportunities, but also looks incredibly suave too. It creates a feature of the corner areas, but allows you to give everything in your kitchen a home. It will also enhance the proportions of your kitchen and create a wonderfully spacious feel for your new kitchen area. Finished with a sunken sink area and shiny silver faucet which perfectly contrasts the wooden oak hues of your new kitchen, the Broadoak Natural contemporary oak wood kitchen will add a modern twist to your home. Don’t forget, with Number One Kitchens based in Manchester, you’ll always get a price match promise on your new kitchen, which means you won’t find it cheaper anywhere else on the web – or if you do, we’ll match it. Simply give us a call on 01706 640 395 for a quote on your new Broadoak Natural kitchen and for information on how Number One Kitchens can help you transform your home in an instant.